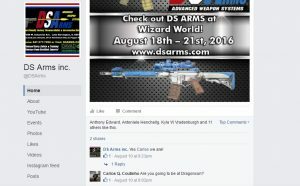 UPDATE 8/18/2016 11:30pm: The Chicago Tribune published a story tonight that interviews Wizard World’s Jerry Milani as well as DS Arms owner Dave Selvaggio. Their article says the DS Arms booth was up for 90 minutes today before Wizard World took it down. Secaggio also says he plans to exhibit at Dragon Con. Original story is below. The world of comic conventions was thrust into the gun debate this week when it was discovered that DS Arms, an Illinois-based manufacturer and distributor of firearms was going to be exhibiting at Wizard World Chicago, which started today. The idea of a gun dealer exhibiting at a con is controversial enough, but especially in the Chicago area, which has had around 2,100 victims of gun violence through the first half of this year, which The Chicago Tribune notes is a 30% increase over the same time last year. 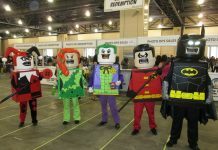 The controversy involved not just the choice of this particular exhibitor, but also how Wizard World handled the situation and inquiries from the media. 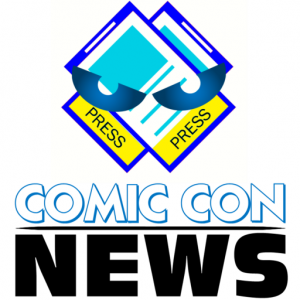 The news was first reported by Tom Spergeon at The Comics Reporter, who spoke with Wizard PR person Jerry Milani. 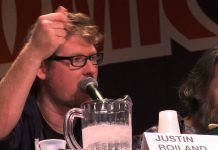 Milani told The Comics Reporter that the booth space had been booked by a third party and when Wizard found out that DS Arms was a real arms manufacturer, they uninvited them. However, on Monday Rich Johnston of Bleeding Cool News spoke with Milani, and was told that DS Ar ms would in fact be exhibiting. Milani said DS Arms would not be offering real weapons. (The implication was that they would be offering replica’s and non-working weapons.) But could let people know real weapons could be purchased via their website. Johnson also took note of a comment on the DS Arms Facebook page noting their participation at Wizard World. A commentor asked if they would also be attending Dragon Con in Atlanta, and DS Arms replied that they would be attending. 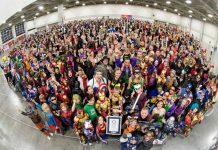 There has been lots of great reporting of this issue, but interestingly, there seems to have been little reaction from the guests and creators that attend the cons, and arguably are the primary draw for many attendees. So today we sent tweets to a number of creators asking how they felt about a real gun dealer exhibiting at Wizard World Chicago and at Dragon Con. Many did not reply. However those that did were clearly against the idea. Gail Simone responded with “Ew”. Writer and Artist Kate Leth noted that at the same time that Wizard was allowing a real gun dealer to exhibit, Flame Con had just banned toy guns. Frank Gibson and Becky Dreisdadt, creators of Capture Creatures added they also would no longer attend those shows in the future. The story moved more into the mainstream this morning with an article in The Hollywood Reporter. We’ve seen some confusion recently. The entity, DS Arms, does not have a vendor table nor is allowed to sell at Dragon Con 2016. But it turns out that wasn’t quite the complete story. Hannah Lodge at The Comics Beat followed up with Dragon Con Director of Media Relations Dan Carroll who said that DS Arms would in fact be participating at the con. Not as a vendor, but rather as a participant in their exhibit of historical weapons, called The Armory, which the con has had since 2009. And then about an hour before the doors opened to Wizard World Chicago, Chase Magnett updated his story to say that writer Steve Horton had verified that DS Arms would not be exhibiting at the show, though it remains unclear who made that decision. We look forward to covering these issues in the future. The takeaway here is “never meet your heroes.” The fact that so many brilliant comic creators are clueless, closed-minded, hard-left ideologues willing to bully strangers into caving to their demands, to the applause of a news media just as clueless, closed minded, and hard-left, is maddening. But, I suppose, to be expected.